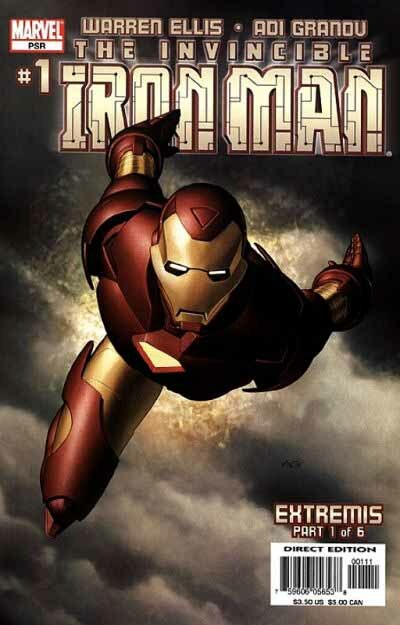 All logos and covers ©Marvel Entertainment, Inc. In 1997, as Marvel prepared to relaunch IRON MAN after taking the character back from Jim Lee’s WildStorm Productions, I was asked to submit some logo ideas. I have to say that none of the ones I turned in were particularly inspired. Maybe it was because I liked the one I had done the previous year for WildStorm and didn’t want to compete with it, I don’t know. The first one, above, did at least have the slick appearance of polished metal, a popular logo trick at the time, but the letter forms aren’t terribly interesting. And using this kind of 3D metal logo would have limited Marvel on color choices, too. I could provide a few alternates, like a gold, copper or brass version, but other colors didn’t usually work. This one, very vertical with pointed endcaps is hard to read, and reminds me of a picket fence. Not surprised they didn’t go for it. After a few more along these lines, word came back to include THE INVINCIBLE and a stylized version of Iron Man’s mask in the next round. This one used a circuit design as a background. I’m not sure how it might have worked in color on cover art, but it strikes me as too busy. It did at least introduce another visual element to the logo that related to the character. Electronics had been a part of Iron Man’s armor since the beginning, I think, though the importance and complexity of it continued to grow over the years. But tacking it on in the background, as I did here, wasn’t really a good way to introduce it. I didn’t sell this logo assignment. Someone else, with a much better idea, did. Richard Starkings of Comicraft came up with the winning design, and he succeeded exactly where I had failed by creating a convincing way to embed that circuit idea into the logo letters themselves. He did it by making a much simpler circuit design than mine, really just the suggestion, but it works well, conveying the idea without being too busy. His use of the face mask is also much better, as it half hides between the two words. More subtle, more effective. Yet the light line around the dark drop shadow and mask highlights the eye and mouth brilliantly. THE INVINCIBLE is small and spread out, giving a nice contrast to the rest. It might have faded into background art, but the solid band behind it removed that problem. I think Comicraft did the entire trade dress here, everything at the top third of the comic. They could have saved some art space by making the yellow and brown color bands less tall, but otherwise it all looks quite good to me, and really kicks Iron Man and his logo into the very late 20th century. It was JG Roshell, Richard’s partner at Comicraft, who kicked it into the 21st century with this revised version that first appeared in 2002. At first glance this could pass as some kind of circuit board, but a moment later the words IRON MAN are clearly evident, a nice trick! JG has used a lot more square corners on this one, though some round ones remain. A suggestion of serifs has returned to the I, and every letter has a horizontal gap in it, which you would think would take away from the readability, but somehow it doesn’t, at least for me. The most surprising shape is the O. Never in a million years would I have thought that could work as an O, but it does, thanks to the talent of JG. Around everything is a metallic bevel probably done in Photoshop, allowing for a variety of subtle color shadings. THE INVINCIBLE is larger and free floating again, with letterforms that are more standard yet still with attractive quirks, like the horizontal gap in the B. Really well done, and it continues to be used today. Here it is on the 2005 relaunch of the title. You know you have a strong and popular logo when it survives a relaunch these days. 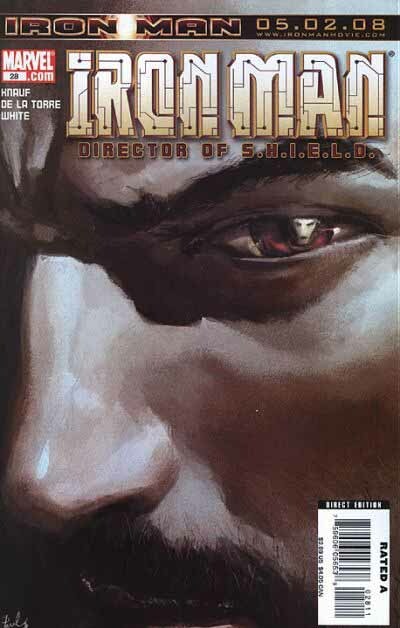 And right up to 2008, with THE INVINCIBLE replaced by DIRECTOR OF S.H.I.E.L.D. and an Iron Man movie plug. Speaking of which, let’s take a look at that movie logo before we wrap this up. Movie logos tend to be very conservative these days, usually relying on a few familiar fonts. This one is better than most. Still conservative, but with some flair. I like the letterforms, especially the partial rounds on the O and A. I like the taller I and M, and the highly rendered metal effects (lots of Photoshop work there) give it just the right amount of realism and wear to suggest both actual metal and an iconic, historic name. And they went with the beveled edges, a good choice! Quite well done, though I don’t know by who (or is it whom?). Hope you’ve enjoyed this brief logo study. I’ll be back with more when I can find the time to do them. This entry was posted in Logo Studies on June 19, 2008 by Todd. Thanks for all of these logo studies. They are very fascinating to read. Logos are usually a very overlooked part of a comic I believe, yet they are so very very important. Thanks!!! Actually my logo is also a testament to JG’s creativity — he used that circuit design on an ULTRON logo and I adapted it for IRON MAN. I’m also anxious to assure you that we didn’t design the trade dress at all, although JG did design the HEROES RETURN lettering and provide the 1st issue bullet — they got their monies worth out of that one! Marvel rarely gives us the opportunity to put together covers except for the Loeb/Sale books where we handle just about everything. Thanks for the clarification, Rich! Here’s another logo that you may have missed. As you can see, it’s similar to the logo from Invincible Iron Man #11,but instead of rivets they went with that criss cross pattern you can often see in metal (I don’t know if the pattern has a name). You’re right, I missed that one. It’s based on the one from 1968, early in the run of IM’s first solo title with a surface of non-skid gridwork. Better than the one it’s based on, certainly! Thanks, Somebody (would prefer a real name, though). The latest version is a variant of the movie logo, which makes sense. I was involved in the vol. 3 logo redesign, not from a hands-on position, but making suggestions and kibitzes. As I recall, my gripe about most of the old IRON MAN logos was that they all focused on the idea that iron is heavy and massive and clunky, producing logos with a lot of weight and heft, and Iron Man the character hadn’t been about that for years. So I pushed for a sleek, corporate-style logo what wouldn’t look out of place in chrome on the back panel of a Jaguar — something that said “sleek, expensive technology.” I wanted Iron Man to feel like the BMW of superheroes — high-end technology, not I-beams. I did suggest incorporating printed circuits, as a means of pushing the technology aspect, but had nothing to do with how they were incorporated. I think putting his mask in the logo may have been a suggestion from editor Bobbie Chase, but I’m not sure. I know, I’m real late to comment here, but I have read your logo studies before and found my way back here only to find you had done a logo study of my favorite character, Iron Man! All very interesting stuff! 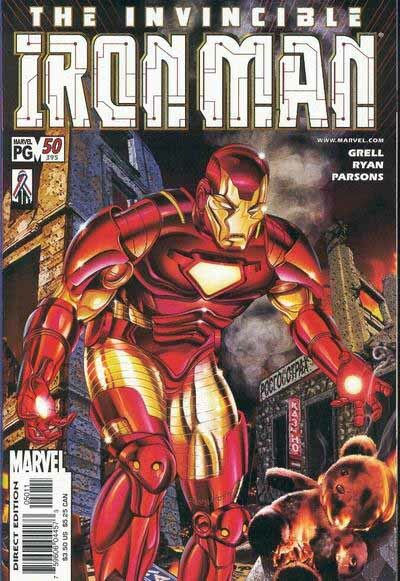 The “200s” logo, as I call the one you designed in 85 and was used for the rest of the volume 1 run, is far and away my favorite Iron Man logo of all time. I like the modern ones too (not thrilled with the one for Invincible Iron Man, but I like the cicuit board one as ell as they very cool Legacy of Doom retro logo), but that triangular-style logo will always be the best to my eyes. 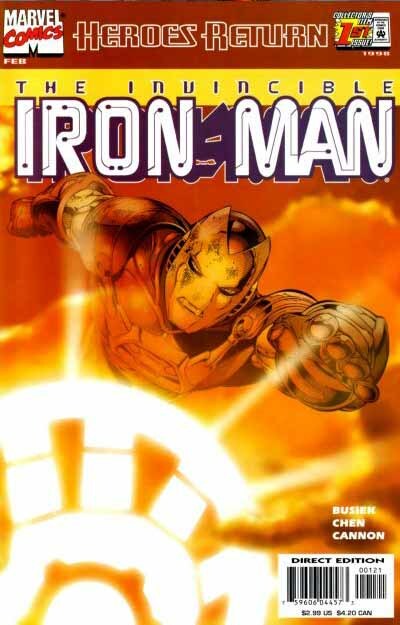 I’m sure that has to do with when I started reading the series but the logo has always struck me as dynamic and modern, two things I want to see in Iron Man. Thank you for posting this very cool logo study! Not sure which one you mean, but I think it’s the one designed by Ken Lopez, not me. Yes, the one by Ken Lopez. I didn’t go back and check, and got which one you designed and which one Ken designed backwards. In any event thank you for shedding some light on Shellhead’s logos, considering that they haven’t exactly been the most endearing over the years. But they hold a lot of sentimental value to a long-term Iron Fan such as myself. I never much liked the whole wiring concept. I much prefer the chrome design.